These chocolate cheesecake stuffed strawberries make a great canape, party dessert or snack! Remove any leaves from the strawberries, then use a melon baller to scoop out the centre of the strawberries. Slice the very bottom off the strawberries so they stand up straight. Whisk the cream in a large bowl until the soft peak stage, then add the cream cheese, confectioners’ sugar, vanilla extract and cocoa powder. Whisk again until combined, then pour in the melted chocolate. Whisk once more until the mixture is light and fluffy. Spoon the mixture into a piping bag with a fluted tip and pipe the cheesecake mixture into the strawberries. 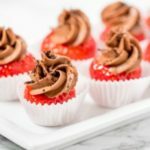 You want to fill the hole in the strawberry, and have the cheesecake mixture swirled on top – like a mini cupcake. Place the strawberries in a petit fours cases and sprinkle the crushed biscuits on top before serving.